Why that “Bargain” might be costing as much as 40 times what you thought you paid. Who hasn’t been in this scenario? You go to the mall and “BARGAIN” you find the perfect top for just $20. YAY!!!! At the same shop you find a cute skirt, a shirt for work and a funky belt. 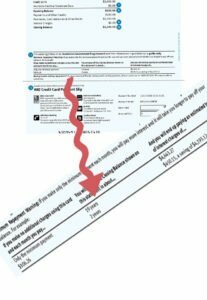 Still on a high, you get home, check the mail, and UH-OH the credit bill is in 🙁 (bummer) A quick glance at it and you see that you are only slightly overdrawn, but you are pretty happy that the balance is only $2100.00, and the bill is only $140.00. Before you get too comfortable in thinking all is good in your “debt world”…What if I was to tell you that your $99.oo “bargains” might be actually costing you over $2000??? HOW CAN THIS BE??? It is because of the power of compounding interest. The same super power that makes rich people richer, also works in reverse to help keep you drowning in debt. Do you just pay the minimum payment on your credit card? Have you had that same card for YEARS and still owe the same amount? Do you have ANY idea when you will pay it out? Let me let you in on a secret….The bank does NOT want you to pay it out!!! You are a veritable cash cow for them. Have a look over your statement, somewhere you should find a panel that shows how long it will take to clear your debt if you just paid the minimum payment. 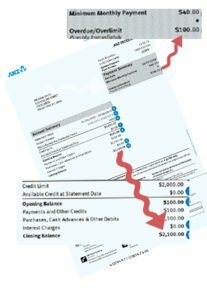 In our example above, we can see that paying just the minimum payment, it will take 19 years to clear this $2100, and you will pay $4600 in interest as well. Are you feeling a little sick right now? Are you wishing you hadn’t spent that $99.00? What if I was to make you feel better by giving you a handy tool that shows you how much you could save by paying any amount off your credit card, mortgage, personal loan or car loan? I have created a super easy to use excel spreadsheet that calculates the value of paying extra toward your debt. As long as you know the amount owing, the interest rate and the time left on your loan, you can have an accurate gauge as to the real cost of any “bargain” you are considering buying. This method has been one of the cornerstone ways we have been able to create our Champagne Lifestyle. By really deciding if a purchase was worthy enough to buy or have that same amount clearing the most expensive debts we were able to be debt free in a few short years. Sign in now to access the FREE basic Loan Calculator HERE as well as other free resources..
Sign in to the Information Vault. (lots of awesome goodies) Let Me In!! In this screen shot, you can see on the left, we have entered the Loan Amount (the balance of our credit card -$2100), the Interest Rate ( also found on the credit card bill) and the Loan Period ( the time to pay out if we just paid the minimum required) Over on the right you will see two areas to calculate the difference if you were to pay a regular amount with each payment or a Lump Sum- one off payment. You can see, I have entered the $99.00 “bargain” shopping spree. If you would have paid that $99.00 off the credit card along with the regular bill, would would have saved over $2000 in interest. Purchase the PLUS version of the calculator and it will provide you with a reference table showing how much you could save by not spending. Based on the details placed in the first table, this next sheet calculates the amount of often purchased items. 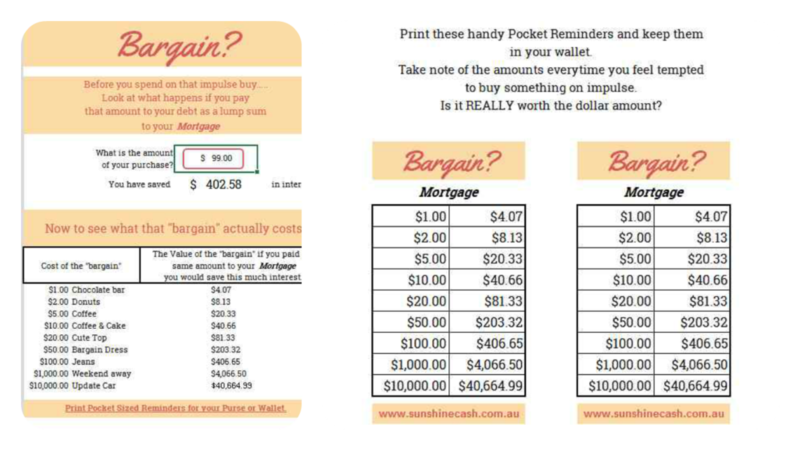 Also included are handy pocket sized printable tables to remind you of the power of paying your debt down rather than spending. When I needed to pay off a large credit card debt, I wrapped the table around my card, so everytime I went to use the card I was reminded. It really does work to rethink your purchases. *Disclaimer. This calculator is for general use only, I am not an accountant or financial planner. Please check with your own bank to determine the exact figures.